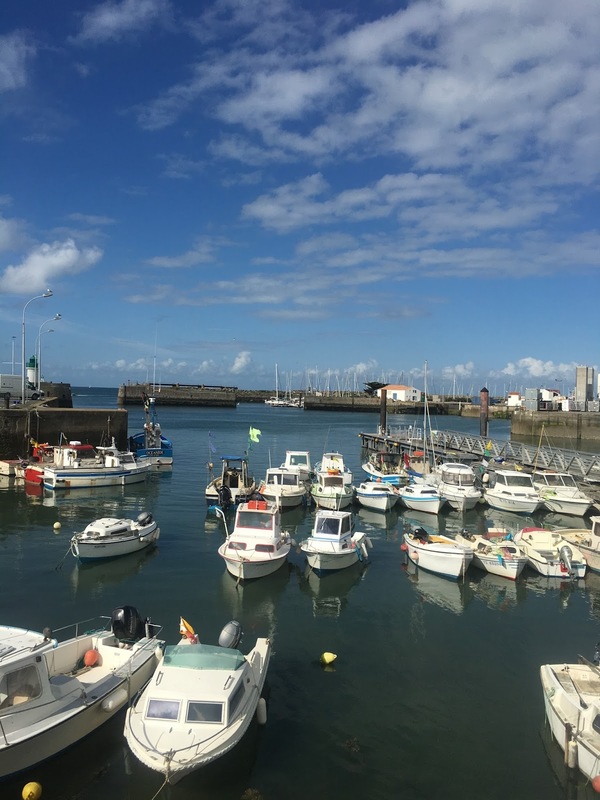 We had a lovely night at Ile Houat but good winds were predicted to be good next day so we got up early and set sail South towards Ile D'Yeu - this was another of Carolyn's picks as it is famous for Tuna and cycling around the island. We had a bit of a motor sail and then the wind picked up for a lovely gentle sail - Andrew did some fishing thinking maybe we could get our own tuna but no luck! Carolyn made carrot cake - yum! We were not sure if we could get in the harbour, which is quite small and would not take bookings, although I called and let them know we were big and were on our way! Anchoring wasn't an option as the swell was due to pick up so if we couldn't get in we would have to sail on somewhere else so we wanted to try and get in as early as the tide would allow. 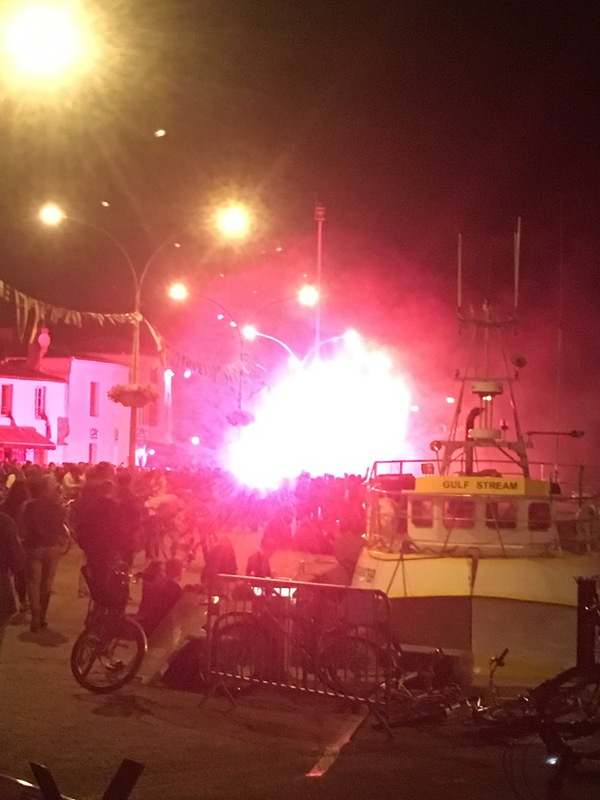 We sailed to the entrance, got everything ready and made sure no ferries were coming out before gingerly making our way in. It sure was shallow; we only had 20cm under our keel! The harbour master met us and said they had a spot for us but wow it was tight and required a very sharp turn with alot of bow thruster - I think the bloke on the boat in the next berth was a bit worried but he need not have been as Andrew did a great job and all the people on the boats opposite came to help take our lines (that's the great thing about these harbours that are full of visiting yachts - people are around on their boats and always come to help - I had forgotten that about Europe). Ile D'Yeu is perfect and Port Joinville is a refreshing mix of fishing boats and upscale tourist resort - I think most of the houses on the island are holiday homes. There are gorgeous shops and fabulous restaurants. We decided we liked it here very quickly; so decided to chill out and spend a few days. 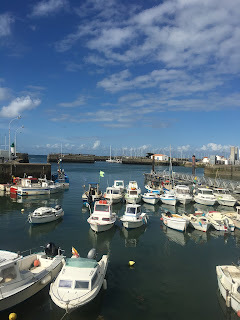 Spent many happy days on Yeu in company with your folks on Silver Dawn...we have cycled most of the paths too and swum off the big beach Plage des Vieilles. 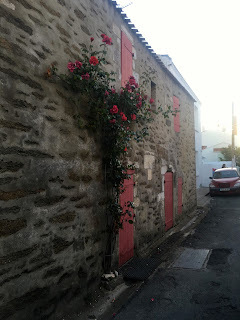 So pleased you had time to spend there, it really is "God's Island' which is what Ile d'Yeu means in old French...Ile Dieu! We were there at the end of May this year. Have fun!